I’ve spent most of the last few weeks scouring Ebay for cheap Jaguar carts, and quickly noticed a trend. Atari had ransacked their back catalogue for arcade classics to release “enhanced” 64-bit versions of. I mean, I guess it makes sense. If I was Atari, and I had some legendary games and a new console, I’d probably put both to good use myself. Unfortunately, not much about Missile Command is 3D, and trying to inject a different perspective doesn’t quite work out. 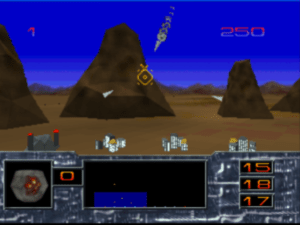 Missile Command was a classic arcade shooter with an original concept for its time. You operated three anti-missile silos inside mountains, with cities nestled in the valleys between. The Soviets, or space aliens, or whoever have decided to launch a barrage of ICBMs at your defenseless cities, and you must intercept them with your own rockets. The arcade cabinet had a rolling trackball set in its center that you used to direct a cursor on the screen. You picked a point in space that the enemy missiles would cross and pressed a button corresponding to the closest silo. A missile would shoot up, explode when it reached the target point you selected, and the expanding radius would trigger any enemy missiles that flew into it. Miss, and your precious cities get nuked. Considering the actual lingering threat of intercontinental destruction at the time, the game was a tiny bit grotesque. But it was fun, and certainly memorable. Not a practical view for playing, but the virtual arcade view is cool nonetheless. A recreation of the original arcade game is the first option available on the cart, and it works reasonably well. The look of the arcade’s multicolored missile lines is faithfully replicated, and the explosions sound about right. The D-pad pales in accuracy next to the arcade trackball, but the job gets done, and the 3-button Jag pad assigns perfectly to your three silos. The game does not naturally fill the screen, which I don’t understand. Instead, you use buttons on the number pad to stretch the vertical and horizontal width to something you prefer. You can also press the 9 key and cycle through 3-D frames to contain the game screen. These are actually pretty neat, and include a TV, an arcade cabinet, and the Lynx. You can then use the stretching keys to zoom in or out and position the angle of the Missile Command playing device in 3-D space while the game chugs along without pause. 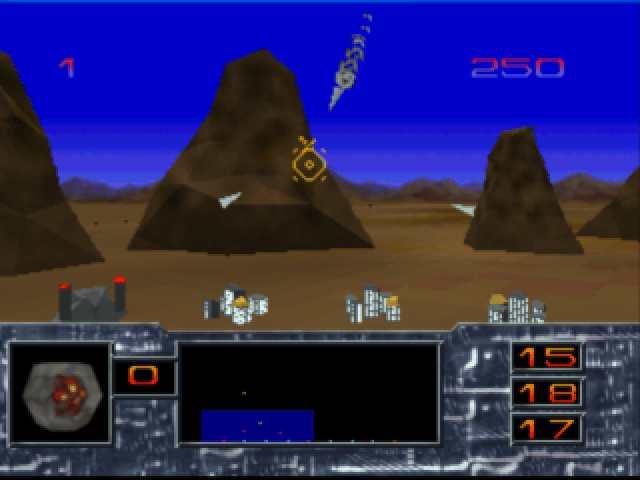 The second option is the titular Missile Command 3D. Here’s where the game derails. It’s a 3D recreation of the 2D game, while never leaving the 2D plane – think of it like a diorama. Polygon missiles fall from the sky and accost your polygon cities, but all on a flat plane at a distance from you – depth isn’t a factor. The D-Pad controls a fixed camera that can only look around and aim a cursor in its center. Controlling a camera instead of an aiming cursor within a fixed view is what ends up being 3D’s critical flaw. Moving the camera to aim means you have to look up at missiles coming down, or pan around to see the different angles of your cities. 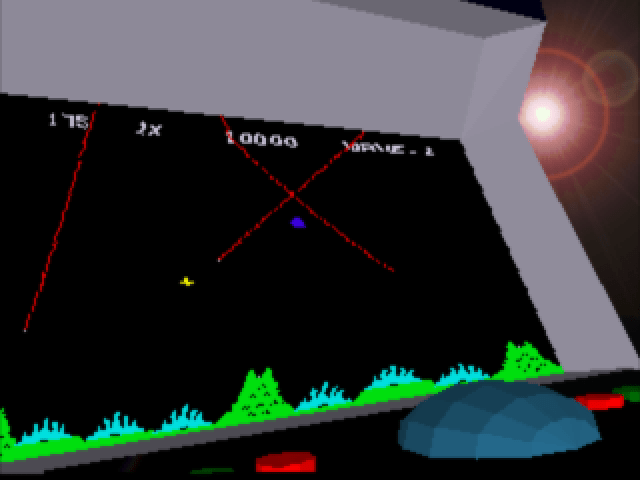 The playfield extends far beyond your camera in enough directions to create a 3D look – it’s a field about 2-3 times larger than your screen to find the damn missiles. Original Missile Command already had a lot of factors and challenge playing into it; you really don’t need to add “hunting for missiles” to that list. A radar at the bottom of the screen makes the game barely playable. A blue box moves around inside the radar and marks out the area that your camera can see. Missiles appear as yellow dots, and you must maneuver the blue box around these dots, then shift your eyes up to the main screen to mark the target area, then back down to the radar before a new batch of rockets can sneak up on you. The 3D game has you panning a camera to target missiles. The playfield looks pretty nice, and the Jaguar crunches the polygons here without much difficulty. There’s not a lot of detail though, and everything looks more like game board pieces. The missiles themselves are triangular shards and can be a bit hard to spot at just the right angle, though they trail smoke to help with tracking them. Backgrounds are some flat mattes of deserts that rotate well in relation to the camera, and the inclusion of rocky-textured polygon mountains in the foreground is a nice touch. The lens flare as your camera passes the sun is another neat attention to detail. Explosions are simple sprites – no particle effects or anything of the sort. It’s nothing to sniff at, mind you, and it does match well against early N64 titles. The game was ported to the PC at a closer-to-budget price, and contains graphically superior versions of both of these modes. It would unquestionably be the smarter version to get if you were interested, except for the final Jaguar-exclusive mode. Called “Virtual,” it’s far closer to the “Missile Command In 3D” idea suggested by the title. It was supposed to go hand in hand with the Jaguar’s unreleased virtual headset (which I drooled over in 1994) and contains a similar camera panning/aiming style as MC3D. The difference is that you actually play inside the virtual field, and command three towers arrayed around the cities you are to protect. Missiles can and do rain down upon you, and you must shuttle between the towers and manage your weapon power to survive. It does make a difference, and is an interesting re-imagining of the Missile Command concept. Keypad keys move you to the three turrets, each of which gives you a different angle on approaching missiles. Turrets are armed with both lasers and missiles. Lasers give you an instantaneous weapon to point and shoot at incoming attacks. Missiles are pods that shoot in the direction you aim with the A button, and are detonated by pressing the button again. Now you DO have to deal with depth, and is expectedly annoying. Without any way to gauge distance, you pretty much must wait until the pods become the same size as the enemy missiles you’re targeting, and then detonate. I’m also not sure how expansive their blast radius is, since the 2D explosion sprites make it impossible to tell. They’re no stronger than the lasers, but they do run off a different charge bar. Each tower also has different charge batteries for each weapon, further encouraging you to hop around towers while you wait for another’s lasers to regenerate. The addition of lasers mitigate most of the difficulties of Virtual mode. Most of the graphical pieces from MC3D get reused in the Virtual game, most notably the cities, turrets, and missiles. Their incorporation is handled better though. You begin in an underwater environment, complete with shields over the interconnected cities, oxygen bubbles floating the surface, and a wavy screen effect throughout. 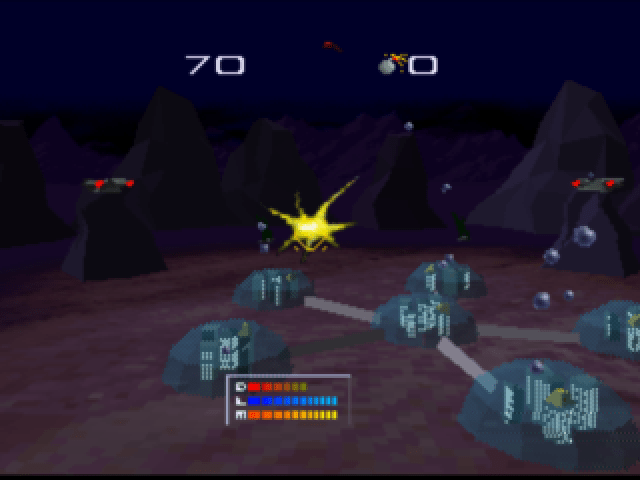 The background art suggests light drifting down from the surface, and the rocky outcroppings have basic, shifting light effects that make them look suitably dim and murky. 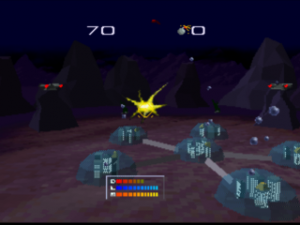 The speed maintained of multiple missiles coming down while the turrets smoothly pan around do more to differentiate this game from other polygon graphics of the time, namely the Super FX chip. The texture work also makes it impressive for 1994 when compared to its competition. As it is, this game mode is the most fully-featured of the three with the greatest longevity. You’ll travel from the sea to the clouds and into space. 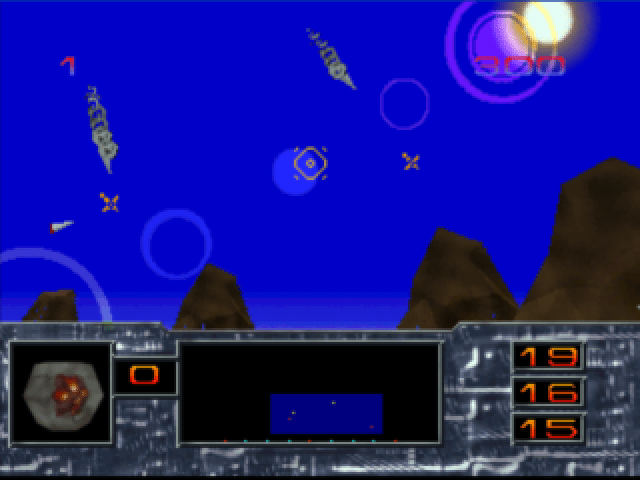 Varying enemy craft and powerups intermingle with the ever-present missile attacks. Bosses appear and must be satisfyingly battled in stages. The only thing missing is a radar similar to MC3D, and you are required to look around and find all missiles yourself. However, since you have the lasers for quick kills, this actually isn’t much of a problem. To me, the Virtual game is “Missile Command 3D,” and the others merely add value to the pack. Virtual is a nice Jaguar exclusive, and a fair amount of fun for a few rounds. Still, neither it nor the inclusion of the two other modes make the cart worth $50 then, or $50 now (you hear that Ebay?) If you really, really want an updated version of Missile Command, the cheaper PC version gives better graphics and better value. Otherwise, totally worth a cheap buy if you already have a Jaguar, but far from a must-play (or should I say, must-pay). Three versions of Missile Command. Impressive polygon graphics for the time, easy to control. Missile Command 3D is a rather pointless update, offering little beyond its poly graphics. Virtual fairs better, but not at its current or original asking price.